Hargobind Singh went to school in India from 1996 to 2006, starting at D Block and moving over to Miri Piri Academy when classes started there. After he graduated he worked for MPA for four years as the assistant to the Spiritual Life Director. In that capacity he led PT, Siri Singh Sahib studies, coached sports, gatka, organized nagar kirtan and other kirtan outings, led Rehras, yoga and facilitated the Gurdwara. 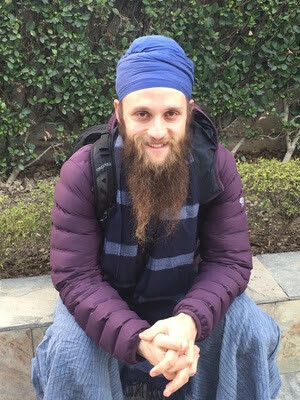 After leaving MPA, he worked for a year at San Fransisco Foliage, a business run by Siri Datta Singh, before going on tour playing tabla for Gurunam Singh. He then went to College for two and a half years, getting an associates in behavioural science, while working part-time. He currently works at San Fransisco Foliage managing a greenhouse crew of approximately twenty people. He married fellow MPA-grad Guru Surya Kaur in 2014. Hargobind is currently in India, attending the Sikh Dharma International yatra. I interviewed him while he was at MPA. You didn’t go to college immediately after high school. What do you think was the benefit of going to college when you were a little older? I remember thinking that it was a good that I was older because the things that they were teaching were not really applicable. So many of the jobs that you’re going to get in life are going to be on the job training. The things that inform that are basic life skills, which some schools teach. I think MPA really does. I’ve found that the things that are applied are patience, communication, listening skills, being able to accept other people’s arguments. They don’t teach that. Colleges definitely don’t teach that. Being able to work hard is something that colleges require and any school would require. I had a bit more of a work ethic built up, a bit more respect for authority. I think its a good idea to do a little bit of work before you go to college, but there is good and bad to everything. Going to school just for the sake of going to school doesn’t make as much sense to me as pursuing a career and keeping eyes on connections that could be made to do other jobs. That’s my trajectory right now. To find something that is fulfilling where I can participate in the Dharma. What’s one thing that you feel you learned through your time at MPA? It might not feel like a good thing if you’re with a lot of people in a yoga class or doing PT or you’re doing something you just hate, like you’re on a 72 hour train ride. Any amount of time that you’re suffering. If you’re in a situation where someone’s leading you and they’re screaming at you to keep up, and you’re trying to power through it. You may fall or you may not be perfect but you keep up and keep trying to do it. The word that comes to mind is grit. It becomes an example. If you’re working at a job you don’t like or in a relationship you don’t like or if you have to tell someone something they don’t want to hear but they need to hear, you just do it by pushing yourself forward to do it. Not in a impetuous way but by keeping up through keeping your eye on the goal. Not waiting for something to be over but staying focused and in the moment because that’s definitely when I’ve been the most on point and the happiest. If I’m thinking about an end point or a goal and telling myself ‘if I just get through this, I’ll be happy’; that’s not nearly as fulfilling as being in the present and using that grit to power through a challenge. Do you have any advice for the current students? Find one thing that you like within the program, even if it’s not the strongest point in the school, but find that thing and run with it and link up with other people who like it too. Whether it’s seva or making langar, math or playing tabla. Pay attention to the things that you’re drawn to and don’t just focus on something because someone else is. Pay attention to your own heart.